What is a baby monitor and why do you need one? Regardless of whether you’re a new parent or you already have children, getting to know your new baby’s different cries and coos takes time. Add in a large dose of sleep deprivation and the chances are you’ll be looking for backup when keeping tabs on your little one. Step forward the baby monitor. The baby monitor market is booming, with a big contrast in the types of devices available. Some deliver audio only, while others throw in video and movement tracking. But how do you know which baby monitor is right for your child? It depends on baby’s needs, your budget and the size of your home. If your child has a specific health condition, for example, speak to your GP to see if the baby monitor you’re thinking of buying has the necessary features for your child. And remember: a baby monitor is not a substitute for your physical presence. Let’s now look at the different types of baby monitors, why you might need one, and the main things to consider if you do want to buy. In simple terms, a baby monitor is a device used to remotely listen (audio-only monitor) or listen and watch (visual monitor) the sounds and movements made by your baby, and sometimes any unusual sounds or movements made in the nursery. High-tech baby monitors with in-cot sensor pads can also track baby’s breathing patterns, body temperature, sleep habits and airflow in the cot. A baby monitor enables you to listen, see or to track baby’s movements and sounds when you’re in a different room, right? So one of the big reasons for buying a baby monitor is to ensure baby is safe when they’re away from you. What if you have a small house, though? Is a baby monitor still necessary? You may hear baby’s cries through an open door or if your home has thin walls, but will you hear baby’s other noises? What if you have to pop outside, to tend to something in the garden or yard? You might not be able to hear baby from there – but you will if you carry a wireless baby monitor outside with you. If you have hearing problems, a baby monitor that flashes or lights up when baby cries will be a great help. Homes with thick walls - effectively a form of soundproofing - will also benefit from a baby monitor. You don’t need to spend a fortune to take home a reliable baby monitor. Yes more money buys extra features, but if you want a monitor that just does the basics there are plenty of devices for under £50. The Motorola MBP8 (also known as the Motorola Digital Audio Baby Travel Monitor in America), for example, offers a decent range and a built-in nightlight for a low price. At the other end of the spectrum are fully-spec'd video baby monitors – and some with companion sensor pads enabling you to track baby’s breathing, temperature and sleep habits, plus the air, noise and lighting conditions in the nursery. Some of the more popular luxury monitors include Summer Infant's Wide View Baby Monitor and the Motorola MBP36 Remote Wireless Video Baby Monitor with infrared night vision and remote camera zoom. Netgear’s ABC1000 Arlo Smart HD Baby Monitoring Camera will launch in the UK this August (out now in the US), bringing with it 1080p HD video, two-way communication, advanced night vision and smartphone notifications. What makes a good baby monitor? A quality baby monitor has a good signal, decent range and indicator lights to let you know if there are any drops in battery life (for non-mains-powered devices), range and signal. They also have multiple channels, which is useful if you live in a dense neighbourhood where your monitor might be prone to interference. If you do live in a built-up area, research DECT baby monitors – they use a microprocessor designed to ensure the only sounds you hear through your monitor are the sounds made by your baby. A baby monitor's range dictates how far you, armed with the parent (receiver) unit, can move away from the stationary (transmitting) baby unit and still receive an accurate signal. If your home is large, look for baby monitors that come with multiple receiver units and stash them around your home. The most common type of baby monitor, perfect for parents who don’t require a visual feed of the nursery. This type of monitor picks up sound from baby’s room and transmits it to the receiver unit, which should be positioned near you. There are some decent audio-only baby monitors to be found for less than £40/$50. The Summer Infant Baby Wave Audio Monitor has 18 channels and up to 300m range in an open space, so it will be less indoors. The BT Baby Monitor 450 Lightshow is worth trying if you want a device that doubles as a light projector to soothe baby at nap time. A video baby monitor also comes in two or more parts. The big difference here, however, is that the baby unit has a built-in camera that transmits footage and audio of the nursery to your parent unit. Some video baby monitors have basic onboard cameras, while others have top of the range cameras designed to capture Full HD footage, and with various zoom and panning functions. You can buy video baby monitors with colour screens, night mode functions and streaming capabilities; the latter enabling you to view footage on your tablet or smartphone. As with all smart home tech, hacking is a potential issue, so ensure that any app-controlled baby monitor you’re thinking of buying has robust security features. There are plenty of video baby monitors to choose from, including Angelcare's AC1100, delivering full-colour video and night vision, the Luvion Prestige Touch 2, with a large, 7-inch LCD touch digital colour monitor, and the Philips Avent uGrow, a HD camera that connects safely to your smartphone or tablet. If your baby has a health issue, or if you want in-depth monitoring of their breathing patterns, body temperature and movements during sleep, you could try a sensor baby monitor. Some have a sensor mat or pad that sits beneath the cot mattress to monitor micro-movements, while others have a wearable sensor that can be fitted to baby’s clothing. 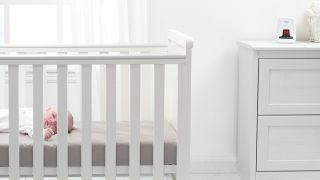 Although there is no research to suggest that sensor baby monitors help prevent SIDS (Sudden Infant Death Syndrome), these monitors remain popular with parents who want in-depth monitoring. Commonly, they come with a companion app so that you can view data (gathered by the sensor) over a longer period to spot any patterns in baby’s sleep routine. The Tommee Tippee Closer to Nature Digital Sensor Mat Monitor is a good option if you’re based in the UK, with the Babysense Video + Movement Monitor popular in America. The highly-rated Angelcare Baby Movement Monitor is available on both sides of the pond, along with the doctor-recommended Snuza Hero SE Baby Movement Monitor that securely fixes to baby's clothing. Would you like a baby monitor that doubles as a nightlight or sound machine? Look for baby monitors with a lullaby setting or built-in light projector. Do you want to see baby as well as hear them? Choose from the many video baby monitors now available. Are you living in a busy street with other young families? Use a DECT baby monitor so that the only sounds you hear are from your baby. Come summer, will you be relaxing outside while baby sleeps indoors? Choose a baby monitor with a decent wireless range. Are you leaving baby with a sitter but want to stream nursery footage to your phone? Look for a high-spec digital monitor that has a companion app.